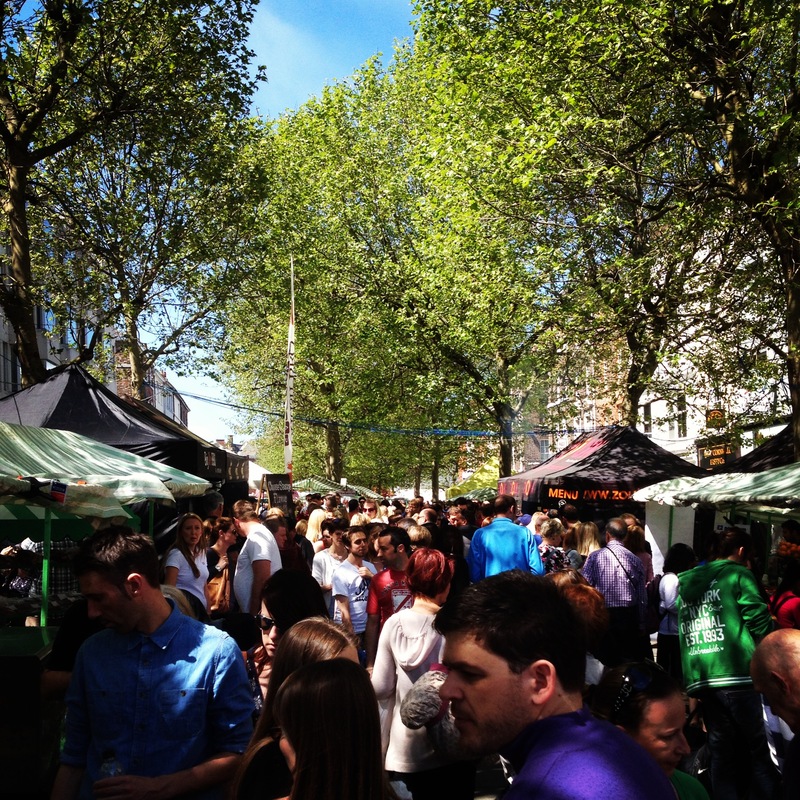 I haven’t blogged in a month, and with good reason. There’s more on that later but for now, lets talk chocolate. I was given the Mast Brothers cookbook for my birthday and, as much as they may have been surrounded in controversy in December, that doesn’t effect the quality of the book. It is still packed with a great range of chocolate based recipes. From the simple all the way through to the more complex. I wanted to make something that wasn’t just one of their basics, but wasn’t in the mood to properly spend the time tempering chocolate. This left a few intriguing looking recipes, and with the realisation that I’ve not made a proper chocolate tart since last summer, I decided to make their Chocolate Pie with Whipped Cream. I meant to do 2-3 different Pancake posts over the last week or so. Annoyingly I got stinkingly ill on Monday and it wrote off pretty much the whole week. Then I didn’t want to has all the pancaking making into a day and eat too many pancakes to myself in one go. So it took getting a couple of friends over for pancakes to happen. But below are two pretty awesome recipes. One sweet and one Savoury, both American style. I did a very poor job with my post last year, so to make up for it I wanted to go a bit further. 1. Whisk together the dry ingredients (flour, baking powder, salt and sugar). 2. Whisk together the milk, egg and melted butter. Pour in to the dry ingredients and whisk until smooth. Stir in the cheese and one of the spring onions. 3. Using a ladel dollop into a prepared hot pan. Frying until golden on one side and flipping over. Fry until both sides are golden and it’s cooked through. 4. 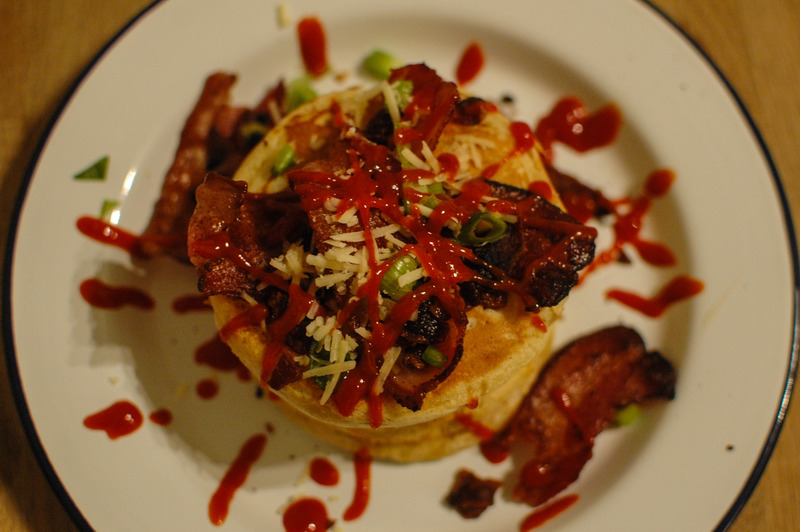 Stack up on the plate, topping with the bacon, extra cheese and spring onion. Add any of the optional toppings (I just went with sriracha and allowed some bacon to get extra crispy to sprinkle on top). 1. Whisk together the dry ingredients (flour, baking powder, salt, cocoa powder and sugar). 2. Whisk together the milk, egg and melted butter. Pour in to the dry ingredients and whisk until smooth. Stir in the chocolate chips. 4. Stack up on a plate, topping with whatever you are using (I used whipped cream). Update time! At last! It’s been a couple of weeks since my last proper update. And well, it’s been a very busy few weeks. From bank holiday shenanigans, to all sorts of gigs and hangs, to a trip to Belgium for Groezrock and jaunts to various bits of the country. Groezrock was the most fun I think I’ve had at a festival ever. And I’ve been to about 20 or something silly like that. It included some of my favourite bands, some of my closest friends and very long (7 years!) overdue Myspace meet-up (HI STEPH. Yup, those are still a thing, even though I deleted mine about 4 years ago). However, the baking as still continued, even if the blogging hasn’t. So it’s past time that I actually uploaded a recipe. I’ve got a couple more to come soon (I hope). I’m going to start doing a gluten free/diabetes themed bake once a month and the first of those will be up later this week (White chocolate and pecan gluten free blondies). 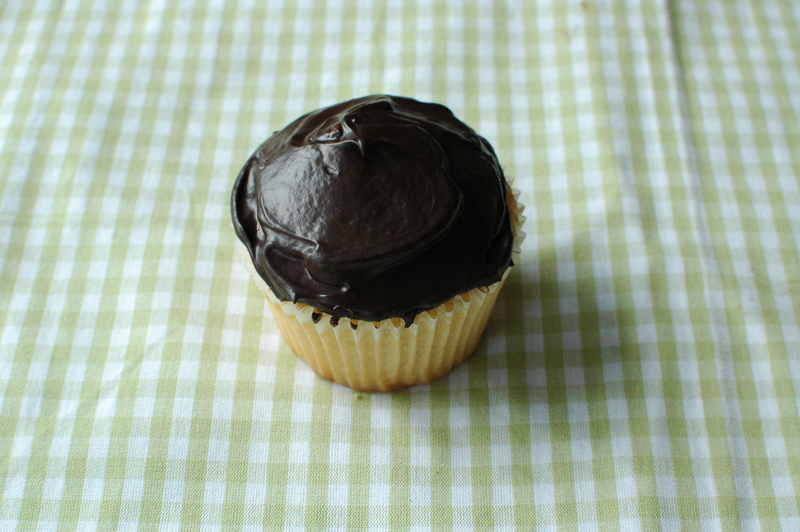 The recipe that I’m uploading now however, is Boston Cream Pie Cupcakes. These were done on request for the American lady at work. It was her birthday and she requested a full Boston Cream Pie, which to take in to work and divide out amongst workmates would have just been too awkward/messy. So I decided on individual cupcakes. The key with these is the cream filling, which needs to be properly thick and creamy. Not just your standard whipped cream. Then the topping needs to be a proper chocolate ganache. These went down a storm and I earned a few brownie points along the way. I found the recipe here. I also have cup measurers now, so as I’m feeling ultra lazy I’m not going to convert from them (for now) sorry! I may at a later date. Start with the Pastry Cream. Heat the cream in a medium sauce pan over medium heat. Bring it to a gentle simmer stirring frequently. Meanwhile beat together the yolks, salt and sugar. Add the cornstarch and whisk until it’s yellow and thick. When the cream has reached its full simmer whisk in the yolk mixture. Returning it to the heat and whisking constantly for about 1 to 2 minutes until it’s thick and glossy. Remove from the heat and whisk in the butter and vanilla extract until the butter is completely melted. Pour in to a bowl and push clingfilm onto the top of it. Place in the fridge to set. This will take at least 2 hours. For the cupcakes. Preheat the oven to 180°C (160°C fan). Line a muffin tray with cases. In a large bowl mix together the flour, sugar baking powder and salt. Add the butter one small piece at a time and continue to mix on a low speed until the mixture resembles bread crumbs. Add the eggs one at a time. Beating well after each addition and scraping down the sides after each one. Add the milk and vanilla, increasing the speed of your mixer to medium and beat until it’s light and fluffy (around 3 minutes). There should be no lumps remaining. Fill the cases ¾ full and place in the middle of the pre-heated oven. Bake for 18-20 minutes. A tooth pick inserted into the middle should come out clean. Allow to cool for a few minutes in the pan before transferring to a wire rack to cool completely. Make the Ganache. Combine the cream, corn syrup, chocolate and vanilla in a saucepan over a medium heat. Stirring constantly to prevent it from catching. Mix until the mixture is completely smooth. Set aside and allow to cool/thicken at room temperature, at least 30 minutes. Assembling the cakes. Using a small knife cut a small circle from the middle of the cake, about half way down into the cake. Carefully take this cone out and cut away most of the base so it just has a “lid” left. Using a piping bag/syringe with no nozzle, pipe the cream mixture into the centre of the cake before returning the lid and pushing down to make the top of the cake flat again. Spoon the ganache over the top of the cakes and place in the fridge them to set. Summer has well and truly hit Yorkshire this last week or so. With the sun shining it has lead me towards some more summer themed recipes. 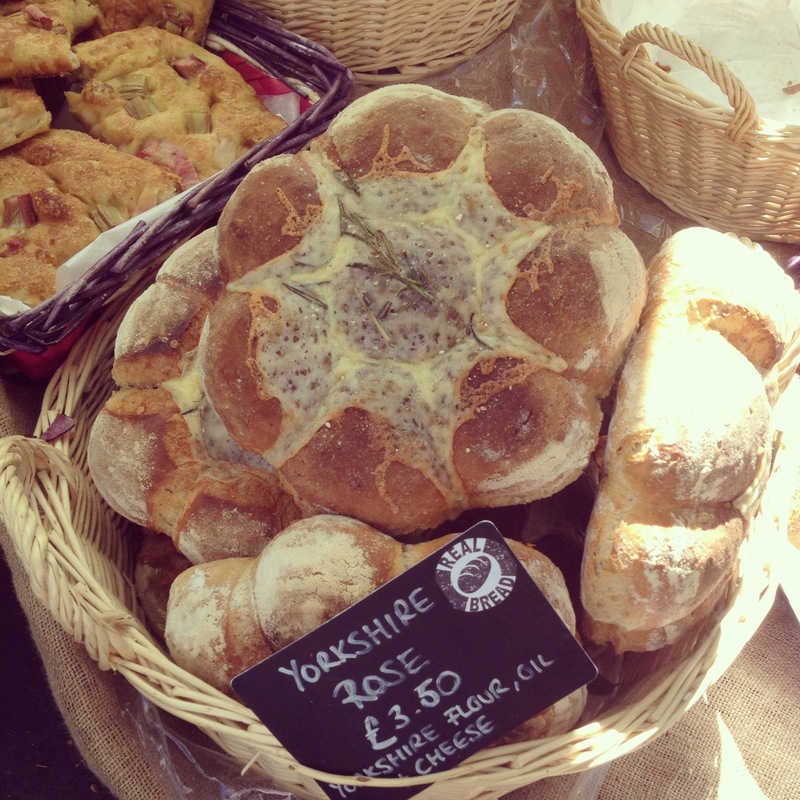 Along with a visit to the York food festival, which is just brimming with local food produce. I stocked up on various things (that my budget allowed) and came home with some Chorizo, Brie, Oak Smoked Cheddar and fresh Strawberries. There was infinitely more that I wanted, but I just couldn’t justify it. 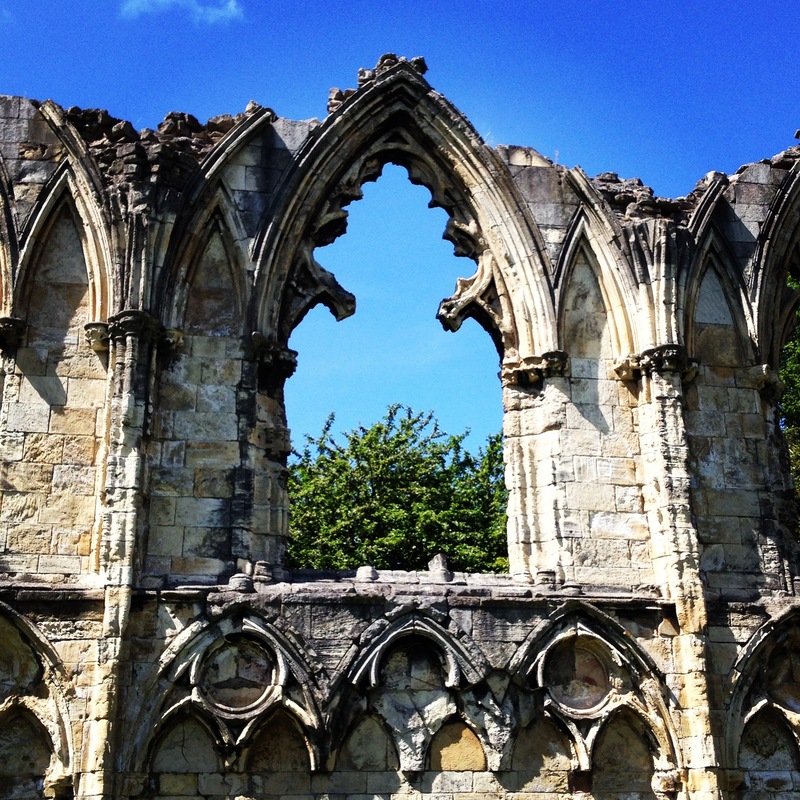 The trip to York was a delight, involving sun, food, ice cream, sights, beer and good company. There isn’t much of a better time to visit York (apart from maybe just before Christmas, when all the decorations are up). When the sun is out it is undoubtedly one of the prettiest cities in the UK. Even if, to me, it has the whole “hometown” dullness that happens when you live somewhere for your teenage years. The pieces I picked up prompted me to make a couple of different things and over the next couple of days I’ll be uploading a couple of different recipes. 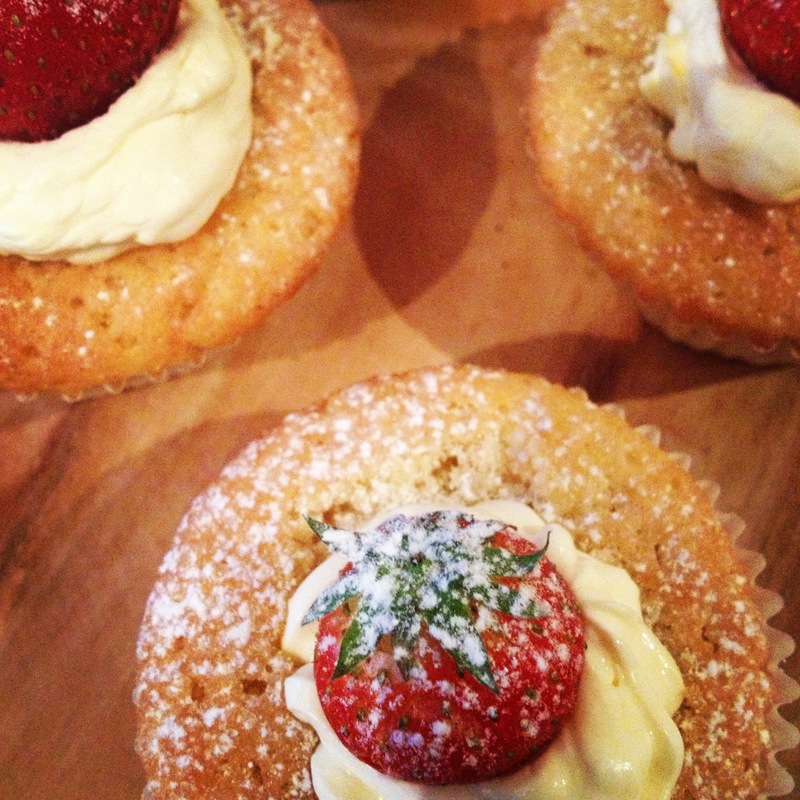 This one involves the strawberries I picked up; Strawberries and Cream Cupcakes. It’s a quick recipe and absolutely perfect for summer. Especially if you are a Wimbledon fan. Strawberries and Cream is just one of the best simple combinations possible. Coupled with the surprise of a Strawberry Jam centre to add that extra hit of flavour these cupcakes can be put together quickly and don’t even feel unhealthy. 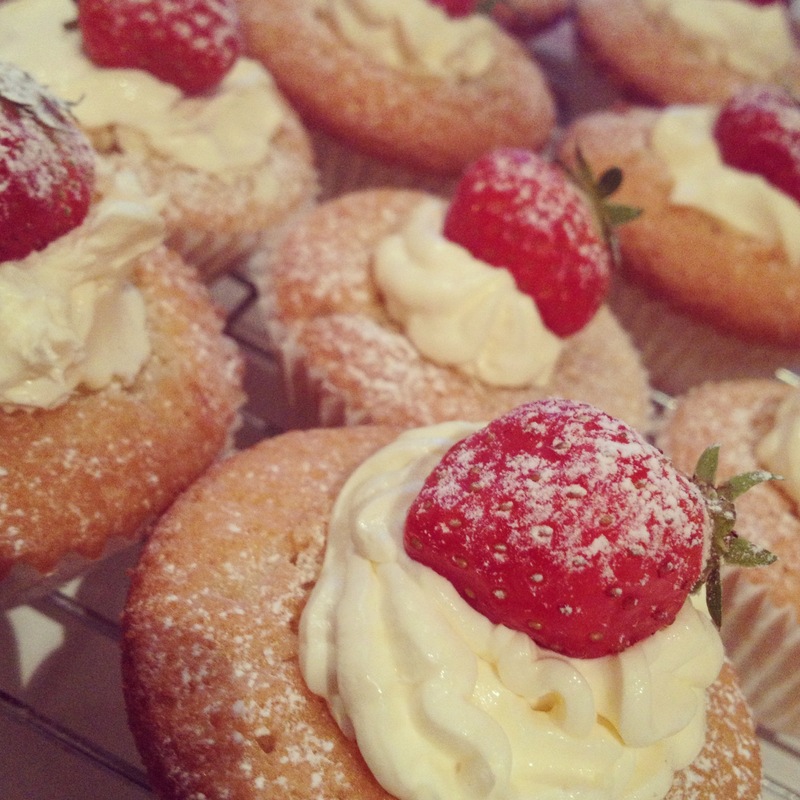 Keeping them small and topped with a fresh strawberry you just can’t go wrong. Preheat oven to 200°C (180°C fan). Line a cupcake tray with cases. Cream together the butter and sugar until light and fluffy, this can take several minutes, so persevere. Beat in the eggs, one at a time. Beating well after each addition. Fold in the flour until you have a smooth mixture, it will be quite thick. Spoon the mixture into the cases, filling about half way. Spoon about ½ a teaspoon of jam into the middle of each case. Cover with more cake mix. The final case should be around ¾ full. Place in the centre of your preheated oven and bake for between 12-15 minutes, or until golden brown. Remove from the oven and set to cool on a wire rack. Once they have cooled, whip up the double cream. With a small sharp knife, cut a small well into the top of each cake. Pipe the cream into the well and top with a strawberry. Dust with icing sugar. Store in the fridge, these are best eaten straight away.